The Equality Illinois Political Action Committee (Equality Illinois PAC) is endorsing the re-election of Chicago Mayor Rahm Emanuel in the February 24 municipal election. 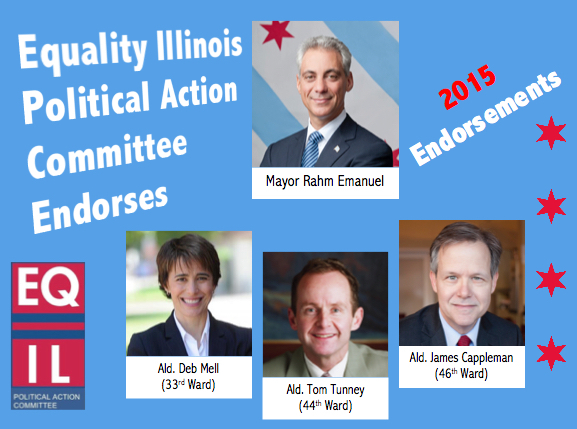 The Equality Illinois PAC also endorses the re-election of four incumbent LGBT aldermen in Chicago and Springfield. “Mayor Emanuel has been a leader on LGBT issues in Chicago, and that’s why he’s the choice of Equality Illinois PAC,” said Bernard Cherkasov, CEO of Equality Illinois.